CHICAGO, IL--(Marketwired - Dec 10, 2015) - Of manufacturers planning to add production capacity over the next five years for goods consumed in the U.S., more plan to add that capacity in the U.S. than in any other country -- a sharp reversal since as recently as two years ago. And a rising percentage of U.S.-based executives at the manufacturers say they are already in the process of reshoring production work from China. These are among the findings of new research released today by The Boston Consulting Group (BCG). Thirty-one percent of respondents to BCG's fourth annual survey of senior U.S.-based manufacturing executives at companies with at least $1 billion in annual revenues said that their companies are most likely to add production capacity in the U.S. within five years for goods sold in the U.S., while 20% said they are most likely to add capacity in China. Asked the same question in 2013, 30% of respondents said that China was the most likely destination for new capacity devoted to serving the U.S. market, while only 26% said capacity would be added in the U.S. (see exhibit). Even though China will remain a major exporter to the U.S., which accounted for around 18% of its total exports through the first eleven months of 2015, the suggestion that the U.S. has surpassed China as the most likely destination for new manufacturing capacity is striking. The share of executives saying that their companies are actively reshoring production increased by 9% since 2014 and by about 250% since 2012. This suggests that companies that were considering reshoring in the past three years are now taking action. By a two-to-one margin, executives said they believe that reshoring will help create U.S. jobs at their companies rather than lead to a net loss of jobs. 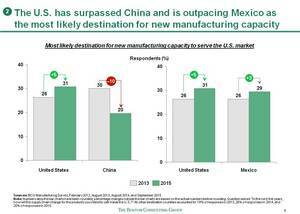 "These findings underscore how significantly U.S. attitudes toward manufacturing in America seem to have swung in just a few years," said Harold L. Sirkin, a BCG senior partner and a coauthor of the research, which is part of BCG's ongoing series on the shifting economics of global manufacturing, launched in 2011. "The results offer the latest evidence that a revival of American manufacturing is underway." This year's survey also confirmed that factors such as logistics, inventory costs, ease of doing business, and the risks of operating extended supply chains are weighing heavily in executives' decisions to bring manufacturing back to the U.S. Seventy-six percent of respondents reported that a primary reason for reshoring production of goods to be sold in the U.S. was to "shorten our supply chain," while 70% cited reduced shipping costs and 64% said "to be closer to customers." "The fundamental economic forces that are prompting many companies to reassess their global manufacturing footprint have not changed," explained Michael Zinser, a BCG senior partner and coleader of the firm's global Manufacturing practice. "Given the big differences in wage growth and productivity -- and the greater attention companies are paying to total cost -- there is good reason to believe that the cost-competitiveness of the U.S. compared with China and many other major export economies will continue to improve in the near term." The decreasing costs and improved capabilities of advanced manufacturing technologies such as robotics also make manufacturing in the U.S. more attractive than in economies whose chief advantage is cheap labor. Fifty-six percent of respondents said that lower automation costs have improved the competitiveness of U.S.-made products compared with similar goods sourced from low-cost countries. Seventy-one percent said advanced manufacturing technologies will improve the economics of local production, and 75% said they will invest in additional automation or advanced manufacturing technologies in the next five years. Even though they plan to invest more in automation, manufacturing executives indicated that reshoring is still likely to create new U.S. manufacturing jobs. Fifty percent of respondents said they expect that U.S. manufacturing employment by their companies will increase by at least 5% over the next five years as a result of reshoring; 27% predicted a job increase of at least 10%. Although the core indicators of U.S. competitiveness remain strong, recent turbulence in the global economic environment -- such as collapsing energy prices and massive swings in exchange rates -- have given some executives pause. The 2015 survey shows that executives believe that the U.S. will account for a slightly lower portion of their companies' global production capacity than they indicated in 2014. The ratio of those projecting net job increases versus net job losses, while still two-to-one in favor of increases, also declined since the 2014 survey, which found a three-to-one ratio in favor of job creation. The underlying drivers of this hesitance go beyond global macroeconomic volatility and include factors such as concerns about rising U.S. health-care costs, federal and local regulatory uncertainty, increases in the U.S. minimum wage, and unclear progress on tax reform. Such concerns are causing companies to reassess their long-term manufacturing strategies. "Although interest in reshoring remains strong, this year's findings indicate that a number of companies are still holding back," noted Justin Rose, a BCG partner and leader of the firm's North American Industrial Goods Operations team who, along with Sirkin and Zinser, is a coauthor of The U.S. Manufacturing Renaissance: How Shifting Global Economics Are Creating an American Comeback (Knowledge@Wharton, 2012). "This reinforces the fact that the U.S. can't simply rest on positive global macroeconomic trends if it is to fully capture the opportunities created by the shifting economics of global manufacturing." To view a copy of the survey findings, please visit SlideShare here. For media requests, please contact Eric Gregoire at +1 617 850 3783 or gregoire.eric@bcg.com. For requests not related to media, please contact Payal Sheth at +1 713 286 7047 or sheth.payal@bcg.com. Since 2012, BCG has conducted an annual online survey of senior-level, U.S.-based manufacturing executives. This year's survey elicited 263 responses. The responses were limited to one per company. Virtually all of the respondents work for companies that manufacture in the U.S. and overseas and make products for both U.S. and non-U.S. consumption. Respondents are decision makers in companies with more than $1 billion in annual revenues, across a wide range of industries. The Boston Consulting Group (BCG) is a global management consulting firm and the world's leading advisor on business strategy. We partner with clients from the private, public, and not-for-profit sectors in all regions to identify their highest-value opportunities, address their most critical challenges, and transform their enterprises. Our customized approach combines deep insight into the dynamics of companies and markets with close collaboration at all levels of the client organization. This ensures that our clients achieve sustainable competitive advantage, build more capable organizations, and secure lasting results. Founded in 1963, BCG is a private company with 82 offices in 46 countries. For more information, please visit bcg.com. Bcgperspectives.com features the latest thinking from BCG experts as well as from CEOs, academics, and other leaders. It covers issues at the top of senior management's agenda. It also provides unprecedented access to BCG's extensive archive of thought leadership stretching back 50 years to the days of Bruce Henderson, the firm's founder and one of the architects of modern management consulting. All of our content -- including videos, podcasts, commentaries, and reports -- can be accessed by PC, mobile, iPad, Facebook, Twitter, and LinkedIn.